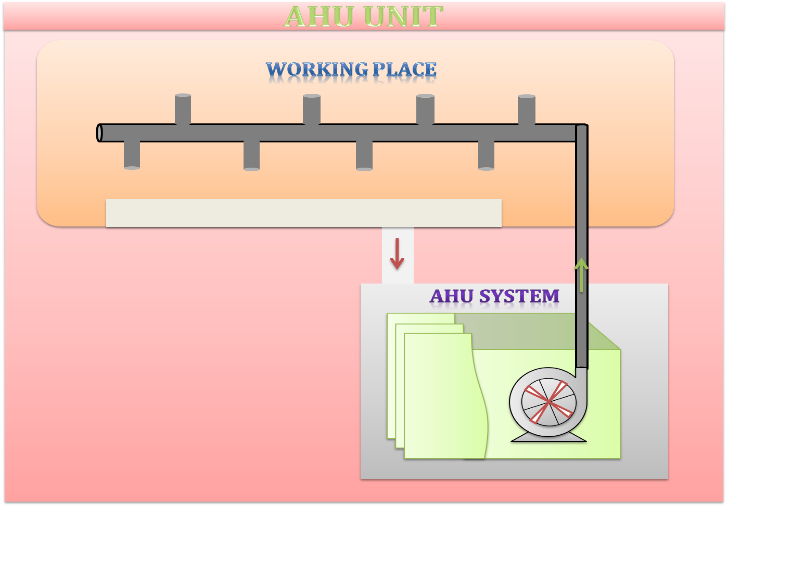 Double skinned type AHU with PUF (25 mm thick) are provided with EFF1 level motors. Blower with paddle blade impeller are provided. Chilled water coil of copper tube with finned aluminum fins provided. Chiller coils with 6 rows with 12 fins per inch spacing provided. The fan is so designed with outlet velocity restriction upto maximum 10 m/sec. 50mm thick air filter with 3 ply HDPE with 2 layers of aluminum provided. The ducts are of galvanized sheet with suitable insulation and support. There are 12 nos of Air handling unit in the premises. Motors are operated through Star-Delta and DOL starter. There is no controlling of chilling water or other sensor to control AHU. From Above Table, 5 out 9 AHU Specific energy consumption kW/TR is higher than design. RPM of fan also has been derived through formula as it connected through V-Belt. Through static pressure it can conclude there is no obstacles in return air path, G-5 & G-6 considerably on higher side. There is a power transmission loss of about 5-7%, when V-Belts “WEDGE IN” and “WEDGE OUT” of the grooved pulley. Prevents elongation due to moisture absorption. Ensure Better Grip of Pulley. Energy Saving of at least 5-7%. Conversion of V-Belt to Flat belt in all AHU’s between Motor and Fan. Please go ahead and get your electrical, thermal devices audited now to save on money. Subscribe our blog and stay updated. How HVAC Company & Architect Company are related ? How to Improve Air Quality through HVAC Company in Offices ? Check our website for more information or any further assistance on HVAC industry and Energy Audit.